On my way home that night as I’m patiently seated in my bus journey from Ayala to Quezon City I scribbled some lines and stanzas in Filipino. And after a few days a full Tagalog poem is born. Final draft written inside Starbucks Matalino, I’m so happy to post this poem on the very month of August as we all celebrate “Buwan ng Wika”. Ito ay aking handog para sa inyong lahat at nawa’y magsilbing inspirasyon upang ipagpatuloy ang pagsusulat sa wikang Filipino. o sa lambot ng unan mananatili, maghihilik? Yesterday was truly a fulfilling night for great and aspiring writers alike. Celebrating World Poetry Day, Filipinas Heritage Library with Metro Serye and Ayala Land gathered great poets as well as musicians in a night of poetry reading and music. 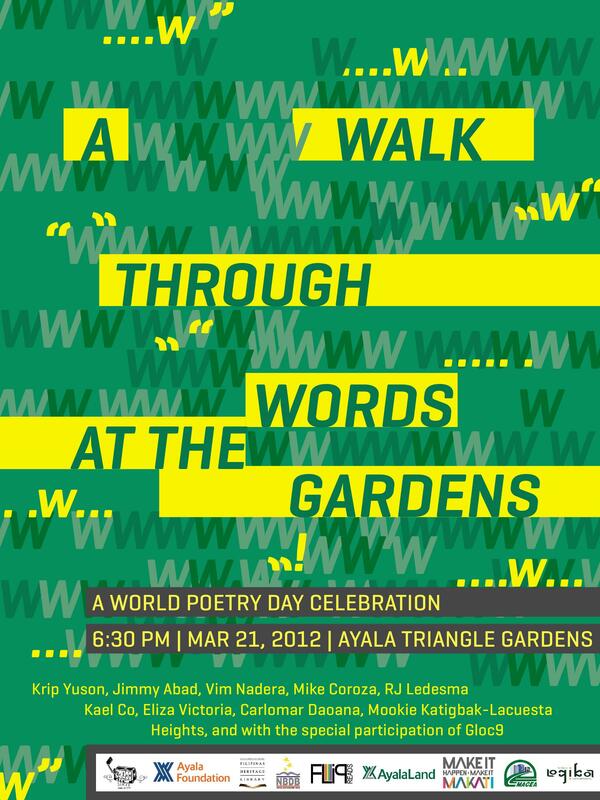 In the heart of the busy Ayala Triangle Gardens I was privileged to be part of this rare thing. I’m a newbie in poetry but all the things I witnessed and listened in these 2-hour literary night awakened something in me. And now I’m sharing a few lines I scribbled in my heart inside a bus on my way home. I love to write again in Tagalog! Ang saya pala!